Want to reduce your heating & cooling costs and save money on taxes & utilities? Start by checking your insulation. 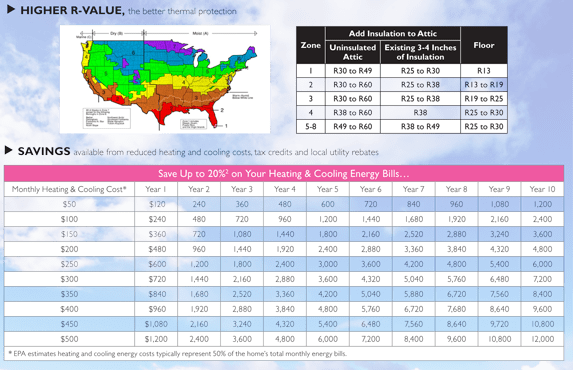 Below is a chart showing EPA esimates on the savings you can experience by improving your insulation. Why Ventilate and Insulate? Trapped heat and moisture in the attic can severely jeopardize the energy efficiency of a home. The combination of insulation and a ventilation system helps to keep excessive household moisture and heat out. As a result, the proper conditions and temperature are better maintained throughout the year. An under-insulated home means you’re paying higher heating and cooling bills. Ventilate and Insulate today and stop throwing money away. Receive a tax credit of 30% on the cost of qualified materials through the American Reinvestment Recovery Act of 2009, up to a maximum of $1500. Reduce your home’s heating and cooling costs by up to 20%. State and local utility rebates available for energy efficiency home improvements. Insulate Now. Save Money and energy and help save the planet.